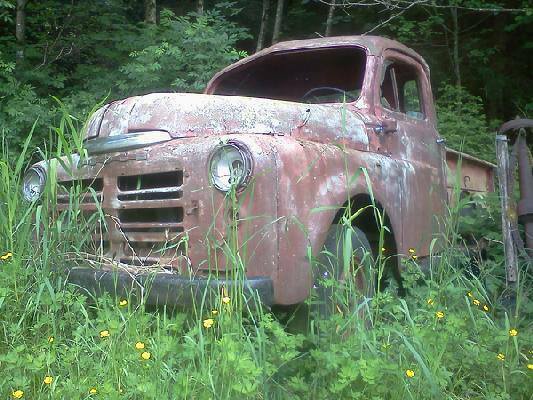 1947 Dodge 1 ton, single rear wheel, Herman bodied delivery truck. This truck has had the brake and fuel systems gone thru. Has four (4) new tires with less than a 100 mi. on them and a new 6V battery. The general condition of the body is quite good for it's age. One back door and one right side cab window are missing but it's flat glass that can be easily cut and purchased to fit. Fenders are very solid with no rust thru anywhere. Fenders have been removed for inspection, minor body work, primed and reinstalled. Wood floor inside box is solid with no observable rot. No obvious rot on body that I can see. One pic of surface rust where I wire wheeled it is included so you can see that the surface rust will clean up with typical sanding/blasting. Truck has clean Arizona title. This truck starts easy, runs and drives. Would still need a few minor things to be considered daily driver material. While this truck will go down the highway at 60 mph, I would not take the chance on driving it home farther than a couple hundred miles or so. I'm willing to deliver for $1 dollar a mile in continental US. Any additional questions feel free to call me, Dave, at 480-540-8784. Please do not call before 6AM or after 8PM PST. Asking $6500 or best reasonable offer. My price was based on research but I never did find another one of these for direct comparison. So if interested, but you consider the price to be unreasonable, call me and let's talk as I'm more interested in selling than getting a specific price. Due to file size I was unable to attach any pics. Send me an email address if you want pictures.